"Mission accomplished. The Arabesque Mini is a beautiful success." In 2008, with its glass-cabineted Arabesque, Crystal Cable introduced to the world Gabi’s ideal full-range loudspeaker: elegant in appearance, exceptional in sound. Besides its transparent enclosure, the most obvious characteristic of the floorstanding, mirror-imaged Arabesques is their unorthodox shape in cross-section, which gave them their name. (From Merriam-Webster’s Collegiate Dictionary, 11th Edition: "arabesque: an ornament or style that employs flower, foliage, or fruit and sometimes animal and figural outlines to produce an intricate pattern of interlaced lines.") 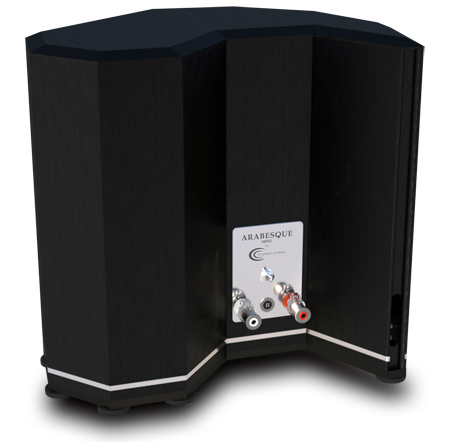 The original Arabesque ($65,000 USD per pair) was reviewed in Ultra Audio in 2009, was designated a Select Component, and then received the SoundStage! Network’s top honor: Product of the Year. The van der Kleys have now distilled the Arabesque’s essence into the stand-mounted, two-way, all-aluminum Arabesque Mini ($25,000/pair with dedicated stands). Its published specifications include: an in-room, near-wall frequency response of 45Hz-40kHz, -3dB; an efficiency of 86dB/2.83V/m; a benign nominal impedance of 8 ohms; distortion of less than 0.5% from 120Hz to 20kHz, and of under 1% below 120Hz; and a solid yet manageable net weight of 40 pounds, without stands. The Mini showed great promise at the 2011 Rocky Mountain Audio Fest, driven by a Devialet D-Premier integrated amplifier, so SoundStage! Network publisher Doug Schneider arranged for review samples to be sent my way. I’m glad he did. Like the Arabesque, each Arabesque Mini is a mirror-image twin of its mate. Unlike its big sister, however, the Mini is neither transparent nor even translucent. Rather, it’s constructed of solid aluminum panels that are beveled top and bottom, and produced for Crystal Cable in California, by Neal Feay. The review pair arrived in a smart, black-anodized finish (a whitish finish is also available). 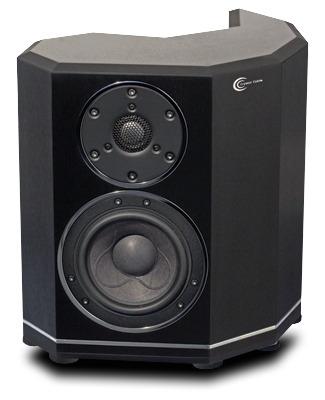 While the Mini’s overall dimensions seem nearly cubical (13"H x 12.5"W x 11.5"D), the speaker itself is anything but. Due to its unique shape, it appears smaller from every angle, and much smaller when viewed from the open side (instead of from the wraparound "tail" end). The primary, front-facing panel is only wide enough (6.5") to serve as the baffle on which the two drivers are mounted, each of which is surrounded by a thin ring of bright-polished metal for cosmetic enhancement. 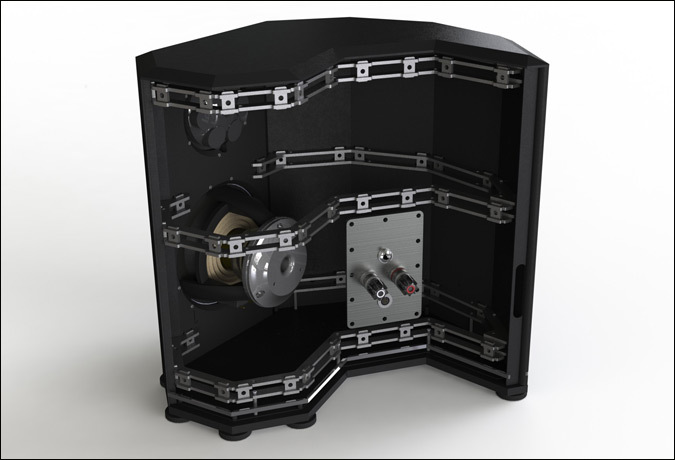 On one rear-facing panel is a single pair of binding posts (the Mini can’t be biwired), a proprietary connector for use with Crystal Cable’s own speaker cables, and a switch that can boost or cut the treble. 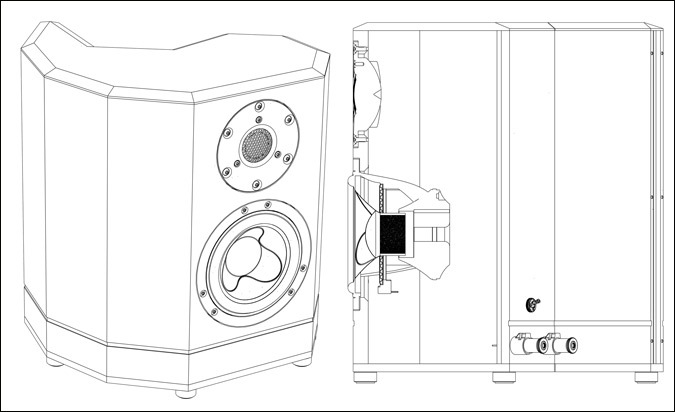 In addition to its shape, the Mini’s other external identifier is a vertical slot (for "friction port loading") running vertically along the terminating edge of the speaker’s "tail."